Bergenholtz Racing and Enkei Wheels have established a marketing partnership for the 2010 Formula Drift race season. With the latest announcement of Joon Maeng as the new Official driver, Bergenholtz Racing is also implementing the all new light weight Enkei PF01 to its Mazda RX8. The Enkei PF01 is designed to be an ultra-light weight but strong wheel. For more sizing and more info on the new ENKEI PF01, Click Here! We at MotoIQ are big fans of Joon Maeng, who as a privateer on the Formula D circuit was, in our opinion one of the hardest working people on the Formula D circuit. Joon would work during the day at his families business, then work on his drift program at night. His car was always sharp looking and well prepped. Joon was also the consummate good sport, always cheerful and pleasant even when things didn't go his way. We are happy to see him at Bergenholtz racing where he will get the first rate support he deserves. –Ron Bergenholtz Team Manager of Bergenholtz Racing. The ENKEI PF01 is the newest addition to Enkei’s Racing Series line of wheels. With its light weight, the PF01 is the hottest racing wheel for 2010. Made with Enkei’s MAT technology, the PF01 is a light, racer friendly wheel. Sized from 15” to 18”, with plenty of clearance for large brake calipers. The new Enkei PF01 is a high quality, very lightweight wheel offered at a competitive price. 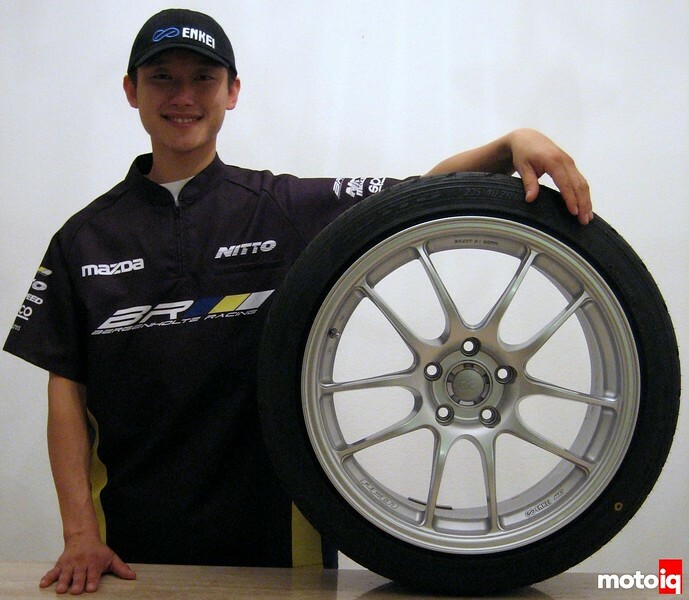 –Joon Maeng pilot of the Bergenholtz Racing/Nitto Mazda RX8.